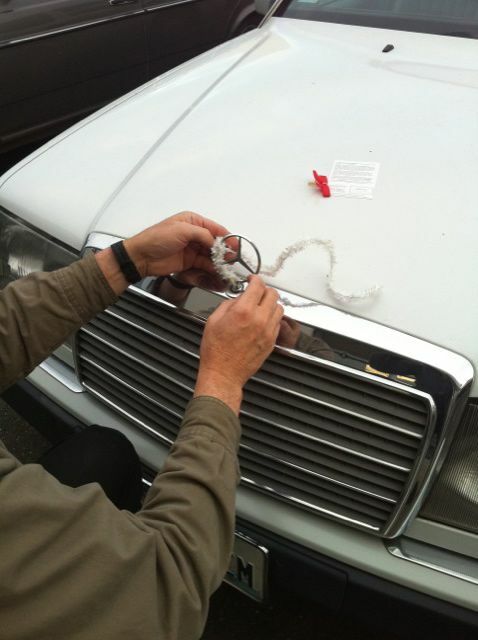 Here is a chance to deck out your Benz this Holiday Season, or give as a gift to the Mercedes fan! How awesome is this for some real Christmas decor! Kent found these and just had to have them to offer to our customers for the holiday season. Available here in a RED/WHITE combination. Also availabe in other colors look below. Installs directly onto your hood star. Red bow is made out of rubber to hold up to the elements. Check out Kent installing one on his Wife Linda's 300D 2.5! He is impressed with the engineering of this fine product. It will not blow off the car even at high speed if installed as per the excellent instructions included! Heavy Duty - can survive up to 90mph! Here is a chance to deck out your Benz this Holiday Season, or give as a gift to the Mercedes fan! How awesome is this for some real Christmas decor! Kent found these and just had to have them to offer to our customers for the holiday season. Available here in Gold. Here is a chance to deck out your Benz this Holiday Season, or give as a gift to the Mercedes fan! How awesome is this for some real Christmas decor! Kent found these and just had to have them to offer to our customers for the holiday season. Available here in Green. Here is a chance to deck out your Benz this Holiday Season, or give as a gift to the Mercedes fan! How awesome is this for some real Christmas decor! Kent found these and just had to have them to offer to our customers for the holiday season. Available here in Silver. Here is a chance to deck out your Benz this Holiday Season, or give as a gift to the Mercedes fan! How awesome is this for some real Christmas decor! Kent found these and just had to have them to offer to our customers for the holiday season. Available here in White.